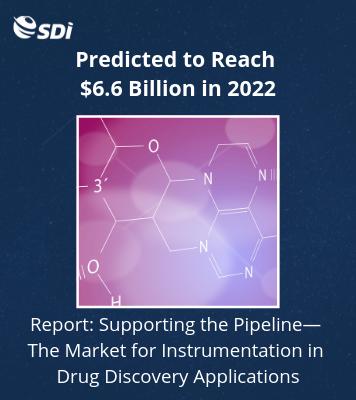 Protein structural analysis is an essential component of developing biotherapeutics. While numerous technologies are used for protein analysis, companies such as RedShiftBio are innovating and building upon techniques such as IR spectroscopy to make protein analysis more simple, cost effective and user friendly. Modern technologies, such as cryo-electron microscopy and neutron scattering (also known as neutron diffraction and neutron crystallography), have surfaced as techniques to analyze protein structure, and traditionally, methods such as x-ray crystallography and NMR have also been employed. However, these modern techniques can be extremely costly, and traditional techniques tend to be time consuming and not without their limitations; for example, it may be difficult to obtain high-quality protein samples using x-ray crystallography, while NMR generally focuses on isolated proteins as opposed to protein complexes. Molecular spectroscopy techniques such as IR and FTIR spectroscopy are alternative methods for the analysis of protein structure. It is easier to obtain high-quality spectra using IR methods due to the small amount of protein sample required. Also, it can be used for analyzing a wide range of protein samples (both small soluble and large membrane proteins), making it more cost effective and efficient. Building upon this method, RedShiftBio, a Massachusetts-based provider of analytical instruments for protein analysis, recently introduced a new protein analysis platform featuring the unlikely coupling of IR spectroscopy and microfluidics. At PEGS: The Essential Protein Engineering Summit, held in Boston, MA, in late April, RedShiftBio announced the launch of the AQS3™pro, a protein characterization system for use during the development, formulation and manufacturing of biotherapeutics. IBO spoke with Jeffrey Zonderman, chief commercial officer at RedShiftBio, to learn more about the novel technology. The AQS3pro platform is a combination of laser spectroscopy, microfluidics and signal processing, using a tunable mid-IR quantum cascade laser (QCL) to probe the protein with an optical beam through a microfluidic transmission cell of an approximately 25 μm optical path length. The sample enters into the transmission cell as a continuous flow, along with a matching buffer reference, and both streams are modulated across the laser beam path. “The microfluidic cell rapidly alternates between sample and reference (buffer) streams to continuously refresh the instrument referencing to dramatically improve measurement precision, accuracy and signal to noise,” Mr. Zonderman explained. “What is key is the increased energy of the QCL versus other IR techniques, and the fact that when taking a measurement, the only thing in the optics that is different is the liquid flowing through.” The differences in measurements of the sample and reference buffer remove separate reference measurements and fully automate buffer subtractions, and the integrated bioanalytics software helps provide insight on the protein sample’s structure, aggregation, quantitation, stability and similarity. 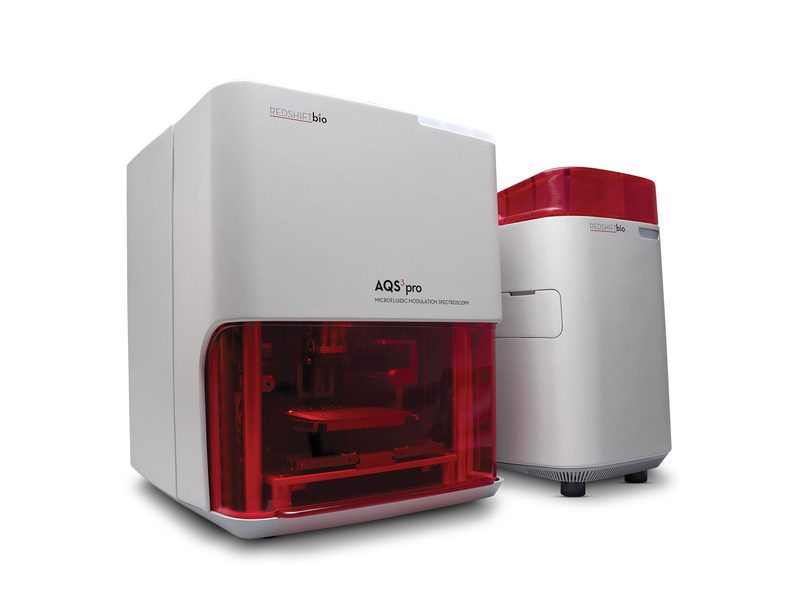 The AQS3pro utilizes RedShiftBio’s patented Microfluidic Modulation Spectroscopy (MMS) technique for label-free protein analysis. According to the company, the technique performs rapid and uninterrupted auto-referencing for accurate spectral measurements. “MMS provides drift-free, background-subtracted, high-sensitivity measurements of the protein secondary structure across four decades of concentration—from 0.1mg/mL to over 200 mg/mL,” explained Mr. Zonderman. “This sensitivity and concentration range is a unique feature of MMS.” The key capabilities of the MMS-based platform include automated multi-sample analysis for walk-away operation and “the widest concentration range to characterize biotherapeutics [and] high sensitivity to see change reproducibly at high precision,” according to Mr. Zonderman. IR spectroscopy is an established tool for protein characterization; however, with IR spectroscopy, generally speaking, sensitivity may decrease with increased protein sizes. The AQS3pro maintains a significantly high level of sensitivity with increasing protein sizes as compared to conventional FTIR techniques. According to Mr. Zonderman, “We do have significantly more sensitivity that conventional FTIR because the increased energy of our QCL that affords us an increased path length.” The simplicity of the platform removes the need for background fluorescence and light scattering, and greatly reduces issues pertaining to protein size. The AQS3pro will be commercially available and ready for shipment by third quarter 2018.